OSCAR - Would you play him tomorrow from the start? Here's a question for Chelsea fans ahead of the game tomorrow - based on recent performances and Andre Schurrle's performance last weekend, would you start Oscar tomorrow? Before you think to yourselves the answer, and I am not digging Oscar out here, I want you to consider his recent performances. 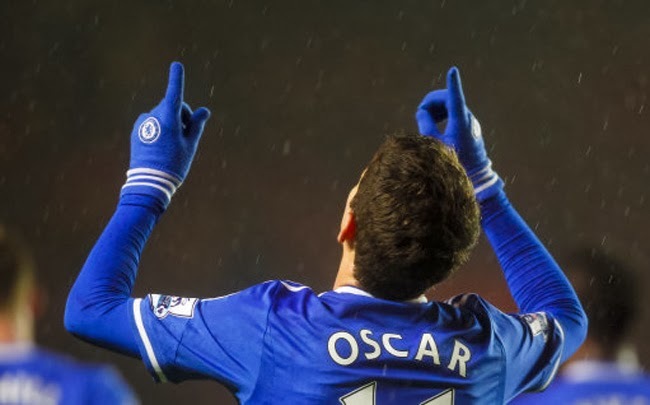 Oscar made the number ten position his own in the early part of the season and was a revelation. Creating and scoring goals in addition to his fantastic work rate. The amount of times Oscar won a tackle or won the ball in our attacking third to start off another attack was really impressive, he was even praised by Chelsea Legend Pat Nevin for doing so. The problem is of late, he has not had the same influence in games and if anything looks tired. I guess there is also his lack for pace compared to the other options we have in attack that sometimes goes against him. Think back to both games recently against Manchester City, Jose Mourinho wanted to set our shape up defensively with Matic and Luiz in the holding role but rely on a fast counter attack so dropped Oscar to the bench in favour of Hazard, Willian and Ramires all supporting Samuel Eto'o. Without question Oscar is a HUGE talent and over the course of a whole season, his good performances will outweigh any of those where he has not been as effective. So looking ahead to tomorrow how do you feel that Jose Mourinho will approach this one? Could pace be in the forefront of his mind? I think it would be hard for Mourinho to drop Andre Schurrle after last weeks performance and tough on the German if that does happen. Surely he has to play him on the opposite side to Eden Hazard as I posted the other day. I believe the decision Mourinho has to make is between Willian (on the bench against Fulham) and Oscar. Both have their strengths and offer something very, very different. We all know about Oscar and his ability on the ball and the fact that he has an eye for a goal. As for Willian, well he has the same but has fantastic energy and you always need some of that in a London derby, especially against Tottenham. So what do you people think? Would you start Oscar tomorrow?